There is a secret to creating killer Smart Playlists in iTunes. You have to know what not to play. The best way to do that is with an “ignore list”. And I’m going to show you how to make one. For several years now iTunes has given you the ability to use playlists themselves as parameters when building smart playlists. That means you can make a smart playlist that does (or does not) include another playlist. Why is this important? It’s important because — if you’re like me — you love to hear almost all of the music in your library, but there is a tremendous amount of stuff that you do not want to hear out of the blue. I play iTunes just about all day long in the office and so I’ve created a playlist “radio station”. (I’ll teach you how you can do this soon.) I try to combine a healthy mix of new songs, classics, a few of my favorites, and a bunch of quirky, silly stuff, and I also try to — just like a real radio station — keep brand new music in the rotation a little bit more. But the key to all of this is my “ignore list” playlist. 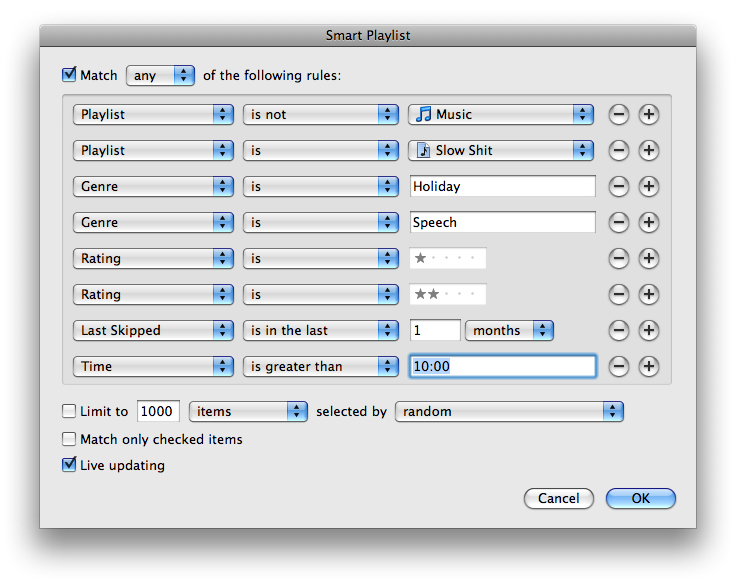 Start by creating a Smart Playlist by clicking “File” and then “New Smart Playlist …” Simple so far, right? There are eight components to my “Ignore List”. Most importantly we want to exclude anything that is not in the “Music” playlist. That means podcasts, PDFs, and the like are going to be in your “Ignore List”. Obviously we don’t want to hear Christmas music in September. And I definitely don’t want to hear JFK’s inaugural address or Alanis Morrissette talking about the inspiration for her songs in the middle of the afternoon. If I skip a song it’s kind of a big deal. I am banishing it to playlist purgatory for a full month! And finally I want to find any song that’s more than ten-minutes long. Now any time I make a playlist, I use my “Ignore List” in it by making the first parameter “Playlist is not Ignore List”. Since the “Ignore List” contains all of the songs I don’t want to hear at random, it’s an automatic censor. And of course you can tweak it around the middle of December and remove the “where genre is holiday” parameter to get all your Jingle Bells into the mix. All your merry music will instantly pop into any playlists which use the “Ignore List” as a base. Next week I’ll explain how to build a radio station based on a combination of your playlists. And if you have any tips or tricks for organizing your music in iTunes, leave ’em in the comments! Next Post College Football Season Is Here!